Welcome back. 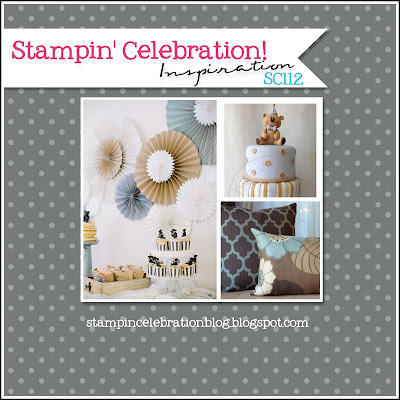 It's time for another Stampin' Celebration! inspiration challenge! I needed a baby card for our former Nanny. She was married about 2 years ago and expecting their first child. Such a sweet time for them! Confession, I actually made this card for the sketch challenge we just finished but decided to use it for this inspiration challenge instead. The colors were perfect for this inspiration as well as the baby theme. I used Sweet Lil' Things Designer Series Paper from the Stampin' Up! 2015-2016 Annual Catalog. I loved the images as they could be for a baby and yet the images are versatile enough to be used for other occasions as well. I wanted to bring a rustic effect to the card so I used burlap ribbon and a wood grain stamp for the star. For the woodgrain star, after stamping the woodgrain I die cut 3 of the smallest stars from the Stars Framelits collection and then glued them together. I wanted a larger darker star behind the top star to add contrast on the burlap. I had to make the layer by die cutting the next size from Early Espresso cardstock and then trimming the star down so it was not so large. I used linen thread to hang the onesie from the star. A small glitter gold star and a fussy cut greeting finish the effect of the card. I guess with all of the blue and brown color this could be a card for a boy. If it's a girl I may have to make a new card ;0). Hope you join us for this challenge! I could see using this sketch for Holiday cards as well!